First step, gotta know how to type - at least a little bit. Learning where all those letters are, using Type to Learn. For the second day of school, I was very pleased. The kids are just amazing. It will be a very good year. 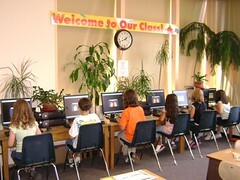 Hey Mark, it's good to see your starting your students out on the computers the first couple of days of school! I also wanted to ask your permission to use a power point presentation you created to introduce blogging to the students' parents. This will be the first "full" school year that my class will be using a blog. I thought it would be a great idea to show the parents something that explains blogging to them. I ran across your power point and thought it was an excellent presentation. I wanted to check with you to see if it's ok for me to use with my parents (with a few minor changes). My email is hjseufer@episd.org. Thanks for being a great model of what student blogging can be. P.S. I'd love for you to share why you have kids blog in your classroom! Herman, sure, use that powerpoint, or the video that went with it - it's out there for anybody, but thanks for asking.